School’s out! Summer’s here! Woo hoo! 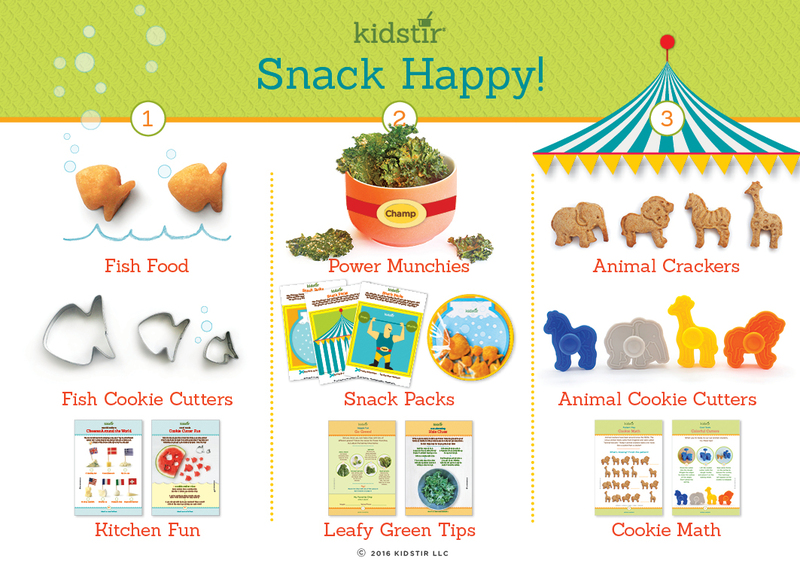 I’m so excited to introduce you to our Snack Happy kit! Snack Happy Kit this month! It’s time for some playfully delicious fun in the kitchen this month! Doesn’t it seem like summer always starts off with a bang? But then it’s not long before the boredom factor sets in and we’re ready to pull our hair out figuring out how to keep our kiddos busy. Here we are, Kidstir to the rescue! With our forever fun cooking projects, cooking tools, educational food games and activities, plus all the extra online recipes, blogs and ideas your kids will stay learning AND entertained all summer long! You may already know this if you’ve been following the story of our little company that has grown so much in the last few years…Snack Happy was our first kit ever! We poured our hearts out when we designed, tested and produced this amazing kit. Happily, it was a hit and here were are several years later, continuing to teach kids to cook with our monthly, home delivered cooking kits for kids. When we dreamt up Kidstir it was important for us that everything inside was easy, beautiful, delicious, and fun. We wanted to select recipes that kids couldn’t wait to make and that moms (and dads and grandparents and aunts and uncles!) could feel good about. Plus, we wanted to make sure every kit had a WOW factor that would get families excited to get in the kitchen now and about what’s coming next month. If I say so myself, this kit is a 10 out of 10 on all marks! Let’s walk through what’s inside so you can see if you agree! First whet your appetite with our great blog post 5 Tips for Quick Snacks. Then be sure to print out these fun downloadables to get your kiddos in the right frame of mind: Eat a Rainbow and Farmer’s Market Hunt. Ready, set, SNACK HAPPY! Fish Food. Did we really manage to make a clean version of goldfish crackers? Yes we did! With just 5 staple ingredients that I am totally sure you have in your frig and pantry right now: cheddar cheese, butter, flour, salt and milk, we developed a recipe that is going to be as popular with the kids as it will be with you. What I love is that the recipe is not just simple and easy to make, but it is truly delicious. And did I mention, adorable? Our fish shapes take this to a whole new place of whimsy and WOW! You are going to make this recipe over and over again. And may I suggest that it goes wonderfully with a chilled glass of sauvignon blanc? Power Munchies. Kale rocks! You already know that, but did you know how easy it is to make crispy, flavored, and healthy (!) kale chips? This recipe demystifies that in a snap. And perhaps even more so, this recipe helps kids love their vegetables. Not just blah, okay, but be excited about, appreciate, and enjoy! You know that I’m obsessed with getting our kids to not just eat but savor their veggies, and our Power Munchies recipe steps up to task, big time! P.S. If you love veggie snacks as much as I do, try our Carrot Chips and Yogurt Ranch Dip recipes out- they make a great pair!! Animal Crackers. OMG. Yes, you are seeing what I am seeing. Not those crazy big bottomless tubs of animal crackers, but a recipe for a cute, yummy, and perfect little batch of homemade animal crackers. We figured out how to put a whole-grain twist on these classics, and you will not believe your taste buds when you take a bite. It makes them even better than what you remember! Kids will love making these with you, and what a wonderful voila you will have when you show off your creations to friends, siblings, parents and grandparents! If you love these crackers, here’s another recipe that we reinvented in an adorable way: Yummy Gummies. Fish Cookie Cutters. Three different sizes of fish shaped cookie cutters that are going to add delight and joy to your life like nothing else! I love these stainless steel cutters. They’re easy to use, easy to clean, and last forever. They’re also versatile. One day you’re cutting out Fish Food crackers, another day, you’re slicing through fruit or bread and adding a special element of fun to an ordinary snack or lunch. And that little baby fishy….so so cute! Snack Packs. None of that store-bought packaging stands up to the creativity and color we have designed into these Snack Packs. Whether it’s the Goldfish Bowl for your Fish shaped crackers to swim in, our Animal Cracker Packs for your little jungle, and Power Munchie Packs for your strong little people to gobble up their healthy veggie chips. After you use up all the prints that come with your kit, print more out here: Goldfish Bowls, Animal Cracker Packs, and Power Munchie Packs. Animal Cookie Cutters. Elephants, zebras, giraffes and lions! What else could a kid want? These are really special little cookie cutters, different than others you may have used in the past. Beyond standard cutters that create great shapes, these also leave detailed imprints on time to really bring those animals to life. You (and everyone else) will be outrageously impressed! 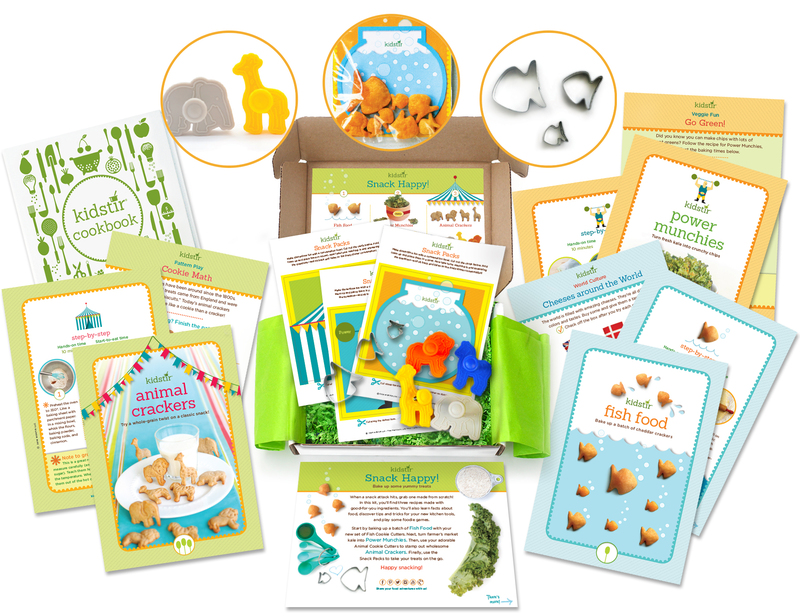 This Snack Happy kit is not just packed with recipes and tools, there is tons of awesome Foodie learning! Everything from World Culture Cheeses Around the World, Cool Tool Cookie Cutter Fun, Veggie Fun Go Green!, Eco-Shopping Kale Clues, Pattern Play Cookie Math, Cool Tool Animal Cookie Cutters, Baker’s Secret On A Roll, Secret Ingredient Kale Class, Tools of the Trade Food Processors. Yowza! Don’t forget there are just tons more fun and tasty snack ideas on our DIY page. Energy Bites, Banana Bites, Parm Pop, and Yummy Yogurt Bark, the options are endless. So are you ready to Snack Happy this month? Then dive in and have a blast. This is going to be your best summer ever! Please do share all your fun experiences, and tips and tricks, with us on Facebook, Instagram, Pinterest, and Twitter. We love letters with photos too, which you can send to email hello@kidstir.com.